Les Blues today outclassed their guests from Ireland to grab top spot on the Six Nations table. France are now the strong favourites to win the Six Nations title. Morgan Parra kicked a penalty and tries by William Servat and Yannick Jauzion, both converted by Parra, helped the French to a 17-3 lead at half-time. A further try by Clement Poitrenaud, plus a further eight points from the boot of Parra and a Frederic Michalak drop-goal made the win comfortable. David Wallace scored Ireland’s try, with Ronan O’Gara kicking five points. Gordon D’Arcy created the first clear opportunity in the 16th minute when he chipped the ball over the head of Poitrenaud but as the pair raced towards the line the bounce did not fall kindly for the Irish centre and the chance was lost. A minute later prop Cian Healy received a yellow card for pulling back Parra as he bore down on the Irish line. Court temporarily joined the Ireland front row, with Stephen Ferris making way for the period of Healy’s absence. Parra slotted over the resultant penalty from close range for the first score of the game. Jerry Flannery was fortunate to remain on the field when he took a wild kick at Vincent Clerc in the 22nd minute but referee Wayne Barnes was lenient and merely reversed a penalty decision. France then piled on the pressure and although Ireland defended stoutly for a period, Servat accepted a pass and barged over the line beside a post after Imanol Harinordoquy had made significant ground in the Irish half . Parra added the conversion to make the score 10-0. O’Gara replied with a penalty two minutes later after the home side were penalised for blocking at the kick-off. France quickly regained the initiative when Jauzion completed a fine flowing move among the backs to score his side’s second try in the 31st minute. 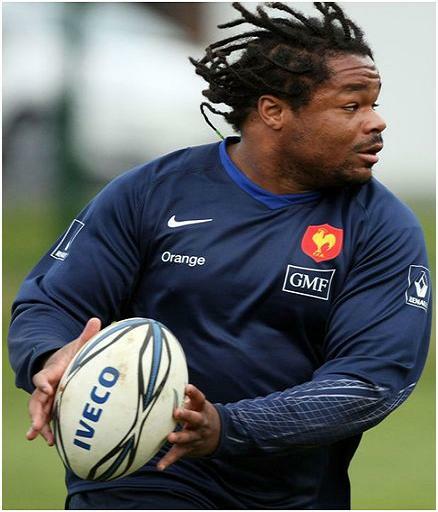 Mathieu Bastareaud played the role of decoy for Jauzion to score, with Parra again converting. Ireland applied late first-half pressure but were unable to find a way through and breach a stubborn French defence. An Irish knock-on allowed the under-siege French to kick the ball into touch and leave the score 17-3 in favour of the hosts at the interval. Five minutes after the break, Clerc almost scored France’s third try but the wing just failed to ground the ball under pressure from Jamie Heaslip. The French reaped the rewards of their territorial advantage when Poitrenaud completed another fine move by diving over in the corner for his side’s third try in the 59th minute. Bastareaud shrugged off the challenge of Brian O’Driscoll to provide the crucial pass for the full-back to score, Parra again adding the two points. Scrum-half Parra further extended his side’s lead two minutes later, landing a sublime drop-goal with his left foot. Ireland replied five minutes later when Ferris offloaded the ball to O’Driscoll and he fed Wallace, who crossed the French line. O’Gara’s conversion reduced the deficit to 27-10. Parra then missed with a penalty attempt but made amends with a successful kick at the posts soon after. Replacement Michalak landed another drop-goal to leave the winning margin a comprehensive 23 points. The French celebrated with a lap of honour and now appear firm favourites to win this year’s Six Nations. France: Clement Poitrenaud, Vincent Clerc, Mathieu Bastareaud, Yannick Jauzion, Alexis Palisson, Francois Trinh-Duc, Morgan Parra; Thomas Domingo, William Servat, Nicolas Mas, Lionel Nallet, Pascal Pape, Thierry Dusautoir (captain), Fulgence Ouedraogo, Imanol Harinordoquy. Replacements: Dimitri Szarzewski, Sylvain Marconnet, Julien Pierre, Julien Bonnaire, Frederic Michalak, David Marty, Julien Malzieu.